We'll be holding a special event to celebrate our 100 million downloads! 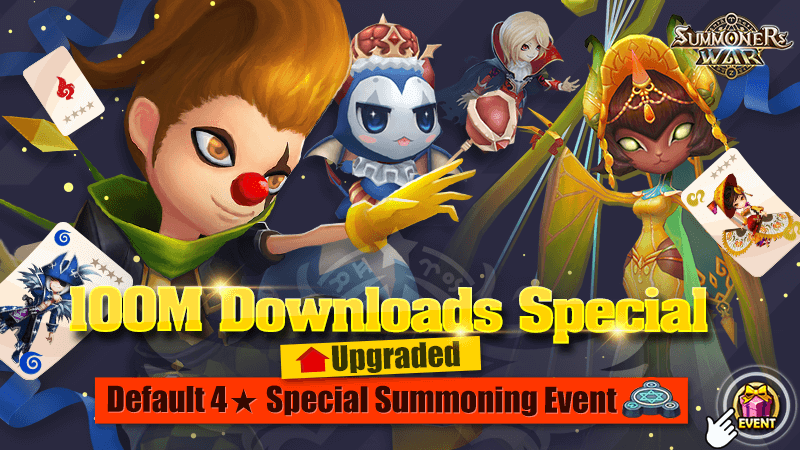 Please see below for more info on the Upgraded Default 4★ Special Summoning Event. Gather points to summon a default 4★ Monster! ※ Please note that you can acquire only one Monster among the Monsters you summoned with points in the event. You can select an attribute of your choice (Fire/ Water/ Wind) to summon a 4★ Monster with 500pts. ※ You can summon a Monster with 500pts, and you can acquire only one Monster among the Monsters you summoned. ※ The same Monster won't be summoned. ◎ Get special rewards according to the amount of points you acquired! Reminder: Please note that you can acquire only one Monster among the Monsters you summoned with points in the event. is this event a joke? after expecting us to summon 5 nat4s, in a fraction of the time? I dont think you understand. You dont need scrolls to summon, you use points to roll for a random nat4 of a certain element which becomes one of many placeholders ... at the end of the event you simply choose which one you want. you collect points to summon a Nat4. this is an easy event. The last event like this was a choice of 10 mons .... is this a choice of 20? The last same event was a bit of a wording cluster eff. You could do a random MS like choice for less points or save up way more for a specific color. Then the way it was worded sounded like the devilmon was with the one you chose. I think to avoid the problems they had they removed the random and made it only the Mon at the end. Im missing 5 Nat 4’s and 4 of them are Water. I really need water boom. *crosses fingers*. Those of you who do not "lack" anything, what will you pick? Oh, you mean water sniper guy or water pewpew girl? Hoping to yoink Zenobia from here. She's the only thing right now I'm missing that I know I can use. I remember the last time this event was around, I was trying for both Lushen and Stella. Hilariously I got them later on with no event lol. Zenobia here would complete my basic element twin sets and I would be able to mess around more in GB10 setups. If the event is as mean to me as it was last time, then I hope I'll get at least Shaina or Sabrina food. Can you save points for 2 weeks or 8 days and do all the summons than for this event? I want to see of Sabrina and shaina pop up on summoning stones tomorrow in 21h and next week also. I have 2 talia and no booms. Best to go for Sabrina? And 1100 summoning stones saved. Stones arent reliable; it may take 7000 stones to get that 1 monster. Personally I don't know who I want the most. On one hand, the fire Cannon Girl, Scarlette seems really good to have. I need Zenobia so that I can have all the elemental twins. And see if that will help me shift to a better GB10 speed team. And I want Skogul, because.... Skogul. Right now I am leaning towards Zenobia. I don't think I can build Skogul very well, and Scarlette seems more like a PvP and toy sort of thing. Zenobia would get me much closer to a stable speed GB10 team. Wow, I guess I do know who I want the most. Thanks for all the help! Tony Sfinos Didn't realize the jew already did a video on her. Just watched it. You are probably right. I would have used her in Necro, but that 3rd skill is kinda dead weight there. FURTHER UPDATE: I got feedback on Reddit about Zenobia. I was advised against running her, and given a couple suggestions for other, better teams, and I am starting to really improve the performance. So Skogul it is then! Guess I gotta keep farming OP runes.... FML I will never be done farming. Am I reading this right? 36 possible nat4s per element, 40 day event, 40 slots per element in event page. If you can get 500 pts per day and get a new choice every day, guaranteed nat4 of your choice? 3, summon 3* ... optional.... don't need to do.. but if at end of the day missing some point and have some scrolls, why not? and .. is 1 month event, easy! Last edited by xaviertkk; 02-19-2019, 07:44 PM.